A well-maintained and affordable home is critical to good health. Yet many low-income people are forced by the scarcity of affordable housing to live with unsafe conditions such as mold, peeling lead paint, and pests, all of which can negatively impact the health of residents, especially young children. 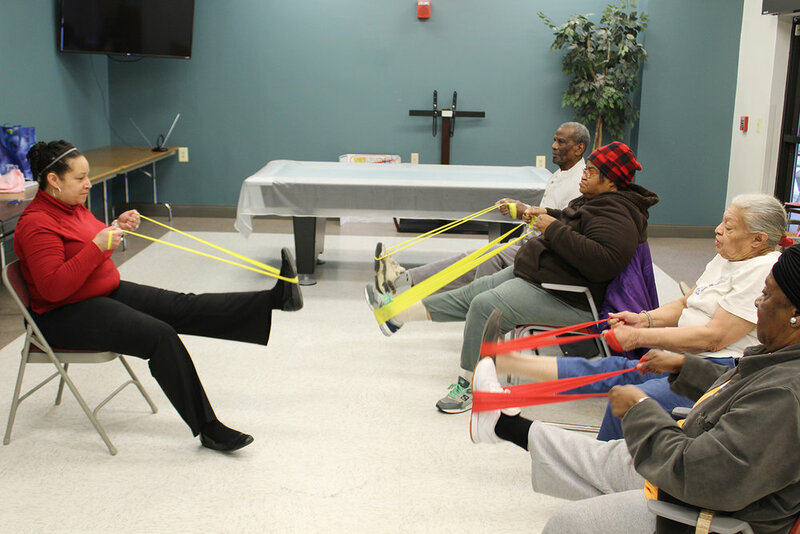 The link between physical health and housing is well-established. In recent years, researchers have also found that where a person lives, grows and thrives can have a tremendous impact on their health. Housing instability can create toxic stress for children and families, resulting in both physical and mental health diagnoses that adversely impact outcomes. SAHF and its members are committed to improving the health of low-income individuals and families not only by providing healthy, safe, affordable homes but also by collaborating with community-based organizations and the health care sector to enrich rental housing with health services. Some notable efforts include an onsite telemedicine service for families and a care coordinator that helps residents manage chronic conditions and access needed health care. Demonstrating that enriching affordable housing with services leads to better health outcomes will take time and persistence. Creating a system to collect and analyze this data is the first step in a multi-year process to identify resident needs, test and revise possible solutions, and determine and disseminate effective strategies. Some data also points to needed public policy reforms, such as expanding Medicaid. All data in the following charts is self-reported by residents of SAHF member properties. Securing health insurance coverage is an important step towards improved health. Resident service coordinators in SAHF member properties can help residents determine their eligibility for various types of health insurance and help with enrollment. Self-reported data indicates that health coverage rates for working-age adults at SAHF member properties are higher than other adults in the same census tracts, and rates for SAHF seniors are comparable to those of other seniors in these census tracts. Coverage rates for children at SAHF properties are lower than in the surrounding neighborhoods, pointing to a particular need. SAHF members do not require proof of insurance when collecting this information. N(SAHF residents 0-17 years old) = 1,082; N(SAHF residents 18-64 years old) = 3,861; N(SAHF residents 65+ years old) = 9,253. Data source is the 2015-16 (R2) Outcomes Initiative data set. Census tract data from the Census Bureau American Community Survey 2014 5-year estimates. How do health insurance rates vary by SAHF member property? 456 properties across 42 states and the District of Columbia submitted self-reported data on their residents in the 2016-17 round of data collection. Of these, 270 properties (59%) indicated that 90-100% of their residents were insured, 133 properties (29%) indicated that 50-90% of their residents were insured, and 53 properties (12%) indicated that less than 50% of residents were insured. Senior properties are more likely to have high health insurance coverage rates. Data collected by SAHF members on routine checkups reveals the importance of helping families access insurance for their children. 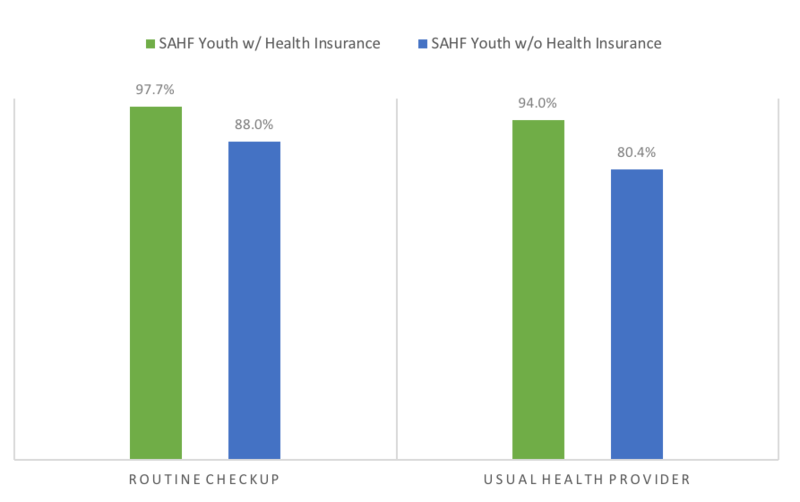 As reported by their parents, youth ages 0-17 at SAHF properties who had health insurance were more likely to have routine checkups and a usual health provider than those who did not. N (youth w/ health insurance who received a routine checkup) = 258; N (youth w/o health insurance who received a routine checkup) = 25; N (SAHF Youth w/ health insurance who have a usual provider) = 616; N (SAHF Youth w/o Health Insurance who have a usual provider) = 112. Data source is the 2015-16 (R2) Outcomes Initiative data set. The Avondale community of Cincinnati, Ohio, is home to Cincinnati Children’s Hospital, a national leader in pediatric medical care. In 2011, as The Community Builders began rehabilitating affordable apartments in the historic neighborhood and working with the hospital, they discovered that it had another distinction—some of the nation’s highest infant mortality rates. “The idea that we would have so much talent to support the health of children in a neighborhood that had some of the worst health outcomes for children—that was our call to action,” said Elizabeth Gonzalez Suarez, Vice President of Community Life at The Community Builders. The Community Builders (TCB), a nonprofit housing developer and manager, turned to the Cincinnati Health Department and Cincinnati Children’s Hospital to forge a partnership aimed at reducing infant mortality in Avondale and improving the healthy development of its children from birth to age six. This initiative, known as Avondale Children Thrive, will include a smoking cessation component and a new full-service grocery store. But its cornerstone is a corps of community residents who provide neighbors in TCB’s nine Avondale properties with evidence-based coaching on maternal and child health and support in connecting to resources for their families. The innovative approach grew from the realization that Avondale mothers and expectant mothers did not see the medical community as their primary source of health information, said Gonzalez Suarez. The initiative launched in late 2017 with a $250,000 two-year grant from the BUILD Health Challenge. Jodi Cunningham, project manager for Avondale Children Thrive, has recruited six neighbors so far by word-of-mouth who were active in the community to serve as “Health Champions.” The partners train them on best practices for safe sleep, breastfeeding, early literacy, quality preschool enrollment, and maintaining client confidentiality. Each Health Champion earns a $200 monthly stipend for 15 hours of work. As of late spring, the six Health Champions served 26 families. The goal is to hire five more this summer, and within two years, to meet all 89 families in TCB Avondale properties with children aged 6 years and younger. Because the program is led by The Community Builders, a housing provider, it enjoys a huge advantage in client recruitment, Cunningham said: she has contact information for all 200 families in TCB’s Avondale properties, and knows the age of each child. Contacting potential clients begins with a phone call from a Health Champion requesting a visit. So far, the response has been overwhelmingly positive Cunningham noted. Expectant mothers get special attention. Lawrence asks if they’re interested in breastfeeding. If so, they’re referred to a breastfeeding support group run by a doctor at the children’s hospital. If not, she shares the benefits of breastfeeding and provides them with materials on the topic. Expectant mothers also receive coaching on infant sleep safety and are eligible to receive a free crib from the Cincinnati Health Department and a “safety bundle” from the children’s hospital with baby gates, window latches, doorknob covers, and more. For all clients, Cunningham maintains a robust directory of community resources to draw on. Health Champion Jennifer Foster describes all the resources she shared with one mother of two, who had recently moved alone to Cincinnati and was expecting her third child. In an early conversation, Foster learned that the woman wanted to work and referred her to an affordable daycare for her toddler and preschool for her daughter. Over the following weeks, Foster helped her client visit several resources including Carmel Presbyterian Church’s food and clothing pantry that provided disposable diapers, a mobile produce market that visits Avondale weekly, and an early literacy program co-led by the community and the children’s hospital. When the mother expressed an interest in a parenting skills group that met at a local church, Foster walked her down and even introduced her to the pastor. 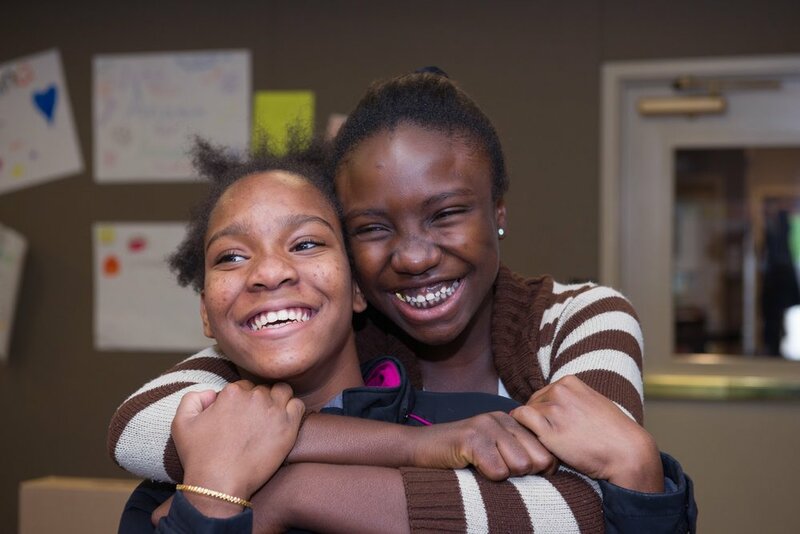 The Avondale Children Thrive partners co-lead the program with the community. Health Champions are encouraged to take the initiative in meeting their neighbors’ needs. Noticing that a young mother was unsure how to prepare healthy dinners, Foster invited her client to her home, gave her some cooking lessons, and introduced her to vegetables she’d never tried before, like cucumbers, red onions, beets, and celery. Three months ago, the mother had a healthy delivery. She’s breastfeeding, reading to her children daily, and has a healthy meal plan hanging on her refrigerator, Foster reported. A challenge to ensuring that residents of SAHF properties have health insurance is the availability of Medicaid in their state. The chart below shows that self-reported health insurance coverage rates are much higher for residents of SAHF member properties in states that expanded Medicaid under the Affordable Care Act. In these states, the health insurance coverage rate for SAHF residents is only two percentage points below the average rate of the surrounding census tracts. In states without Medicaid expansion, coverage for SAHF residents is 14 percentage points lower than in the surrounding area. SAHF and its members can use this data to advocate with policy makers at the state and federal level for Medicaid expansion. In Medicaid expansion states, resident service coordinators can use this data for more targeted outreach to residents to help mitigate barriers to Medicaid enrollment. N (all residents) = 23,022; N (Medicaid expansion adopted states) = 14,837; N (Medicaid expansion not adopted states) = 8,185. Includes youth, working-age adults, and seniors. SAHF data source is the 2016-17 (R3) Outcomes Initiative data set. Source of information on Medicaid expansion is the Henry J. Kaiser Family Foundation, “Status of State Action on the Medicaid Expansion Decision.” Census tract data comes from the Census Bureau American Community Survey, 2015 5-year estimates. Breaking down insurance rates by state helps SAHF members understand the degree to which state-level policies and programs, such as Medicaid expansion, impact coverage rates. The map below compares the percentage of residents at SAHF member properties who report having health insurance (represented by the pie charts) to the overall rate of insured residents in each state. Pie charts that are mostly orange indicate high levels of health insurance coverage for SAHF residents. States that are darker green indicate high levels of insurance coverage for the whole state. States shaded gray are missing sufficient data. In some states, residents of SAHF properties are about as likely as the general population to have health insurance (such as Georgia or Wisconsin). In other states, insured rates differ greatly. For example, Texas has a relatively low rate of coverage for all residents (81%), but SAHF residents in Texas have a high rate of coverage (98%). The self-reported nature of the SAHF data may reduce the accuracy of this data point; SAHF plans to investigate this question further with member input. The pie charts indicate the percentages of SAHF residents with health insurance (orange indicates % insured) while the green coloring indicates the percentage of insured residents within the entire state (darker green = higher levels of insurance overall). States with fewer than 100 residents with health insurance responses/data were excluded. SAHF N =41,338 residents. SAHF Data source is the 2015-16 (R2) Outcomes Initiative data set. Data source for health coverage by state is the U.S. Census Bureau, 2014 American Community Survey, 5-year estimates.